NASA's Mars Exploration Rover Opportunity used its panoramic camera (Pancam) to capture this view of the rim of Endeavour crater, the rover's destination in a multi-year traverse along the sandy Martian landscape. The image was taken during the 2,226 Martian day, or sol, of Opportunity's mission on Mars (April 28, 2010). Endeavour is 21 kilometers (13 miles) in diameter, about 25 times wider than Victoria crater, the last major crater Opportunity visited. 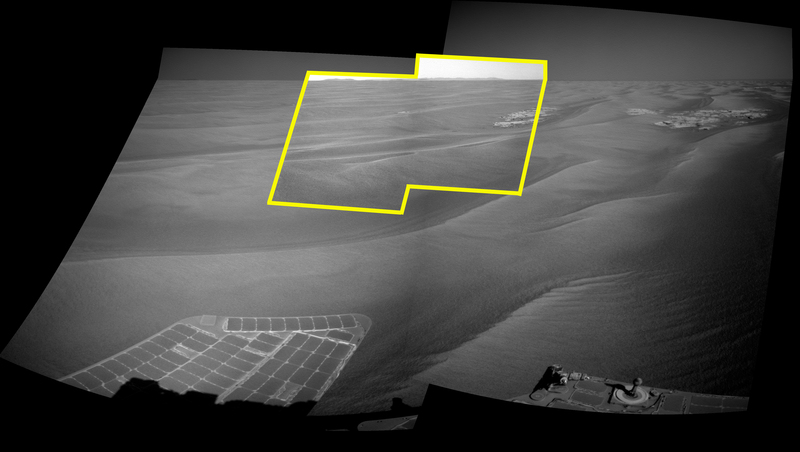 This image shows an outcrop of rocks at the foot of the rover and beyond these rocks rippled dunes, which are about 20 centimeters (8 inches) tall. The west rim of Endeavour, about 13 kilometers (8 miles) away, appears on the left on the horizon. The rim of smaller, more-distant Iazu crater, which is 7 kilometers (4 miles) in diameter and about 35 kilometers (22 miles) away, is on the far right. On the horizon in between is a blanket of material ejected from the impact that created Iazu crater, and darker features that are portions of the west and southwest rim of Endeavour. Opportunity began a marathon from Victoria to Endeavour in September 2008 after spending two years exploring Victoria. The intended route, about 19 kilometers (12 miles) long, has headed south before turning east in order to bypass potentially hazardous sand ripples to the east, larger than the ripples in this image. This approximately true-color view combines three exposures taken through filters admitting wavelengths of 750 nanometers, 530 nanometers and 430 nanometers.